This service enable users to electronically upload print files and issue print and bind instructions for theses, dissertations and reports. Colour and mono printing is available and payment can be made online. RDW’s Eire website has been developed especially to inform you about our wide range of services now available on a direct basis. RDWOnline is our free online lettering service that gives you complete control of your lettering and binding requirements. In-put your requirements for individual titles via the web and we’ll take care of the rest. 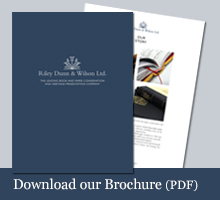 Instructions go straight to RDW production systems, ensuring binding preparation time is kept to a minimum and giving you peace of mind that your precise instructions are being carried out. The details you enter are electronically stored, making it easier and quicker to bind these titles in the future. As you enter your requirements, a price is generated helping you to better manage your budget and spending.